Prostate, Acinus - Secretory Alteration. 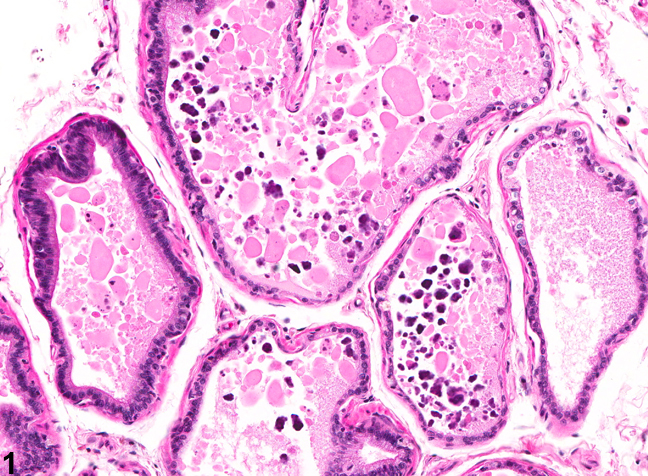 Acinar secretory alteration in a male F344/N rat from a chronic study. Prostate, Acinus - Secretory Alteration. 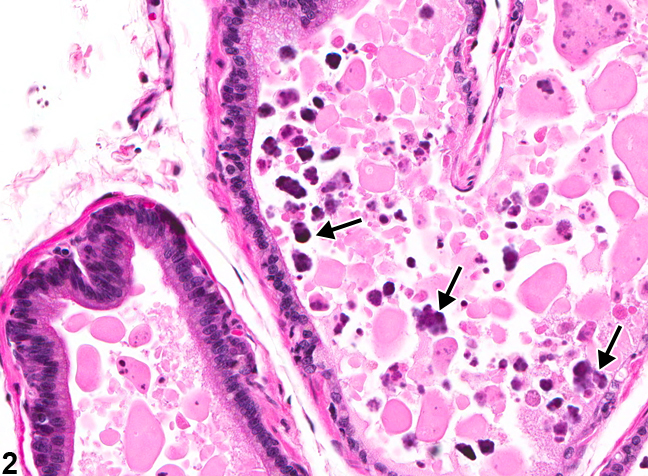 Mineralization of some concretions (arrows) in a male F344/N rat from a chronic study. As rodents age, there is decreased reproductive activity and alterations of secretory material in prostatic acini. This can be generalized or localized within any lobe, but with a predilection for the ventral lobe. 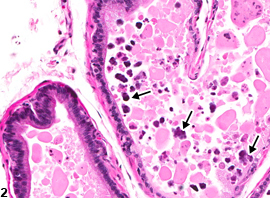 The histologic appearance varies from hyaline masses, to finely or coarsely granulated secretion, to deeply basophilic granular precipitates (arrows, Figure 2 ), often appearing as a mixture ( Figure 1 and Figure 2 ). The acinar epithelial lining typically is low cuboidal to flattened. The altered secretion, sometimes referred to as concretions, is essentially denatured secretory protein and cellular debris, sometimes with mineralization. Secretory alteration is common in chronic studies and is typically not documented unless there is an obvious treatment-related effect. However, it is not common in prechronic studies up to 90 days in duration and should be diagnosed in those studies if there is any indication of a direct or indirect effect of treatment. The affected lobe(s) should be identified if possible and indicated in the tissue identification. Any diagnosis should be given a severity grade, and if paired lobes are affected, the diagnosis should be qualified as bilateral, with severity based on the more severely affected lobe. Lau KM, Tam NN, Thompson C, Cheng RY, Leung YK, Ho SM. 2003. 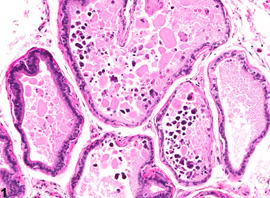 Age-associated changes in histology and gene-expression profile in the rat ventral prostate. Lab Invest 83:743-757.